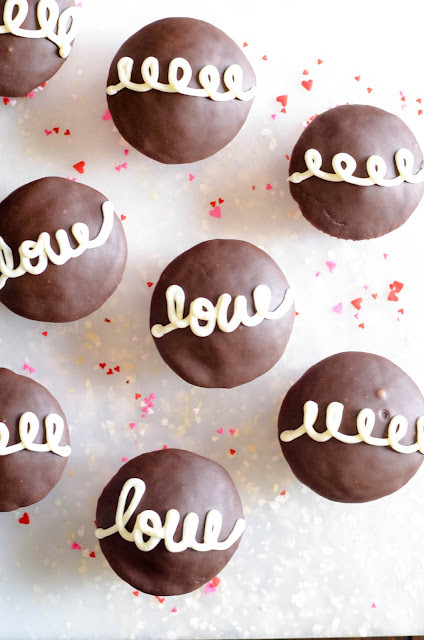 Copycat Hostess Cupcakes with a Valentine's day twist. These cream filled red velvet cupcakes are topped with a fudgy chocolate glaze, filled with cream cheese frosting, and are oh-so-good! I realized as I was making these cupcakes that my daughter has NEVER had real, authentic, honest-to-goodness Hostess Cream Filled Cupcakes. The horror! But in all seriousness, these were such an iconic childhood food for me. I'm not saying my mother fed them to us every day or anything. But we did get them as special treats in our lunchboxes occasionally. And it was glorious. Really. Best thing ever. But that's really not done anymore, is it? I mean, I see they're still in business. So someone must be buying them, right? But somehow I suspect Hostess's new demographic is over-indulgent adults who miss their childhood goodies in a world that's become overrun with Whole30-Paleo-Preservative-and-Dye-Free-Mom-Guilt. As good of a lunch-packer as my mom was, I'm afraid she never put these in my lunch. 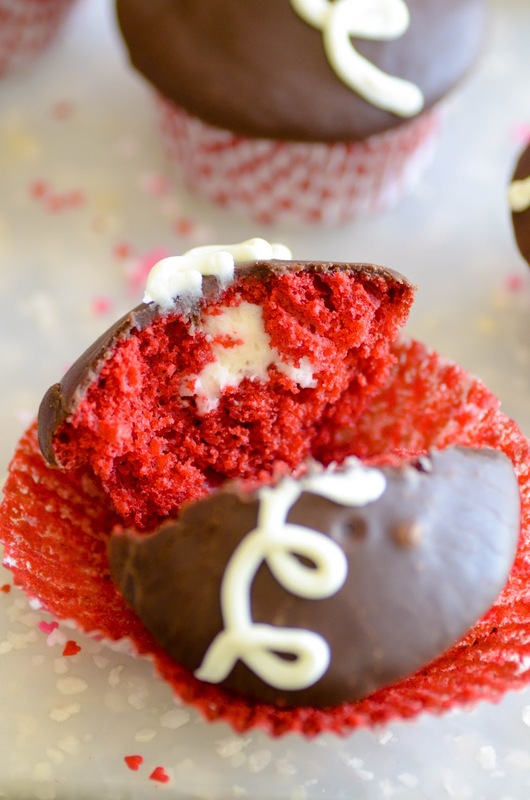 This is a red velvet twist on my beloved childhood Hostess cupcakes, and it is delicious!! Obviously. Because on what planet would cream cheese filled red velvet cupcakes with a rich, fudgy glaze not be the epitome of delicious?! And the best part? Easy to make. SO easy to make. Easier than you're thinking, I promise. Copycat Hostess Cupcakes with a Valentine's day twist. 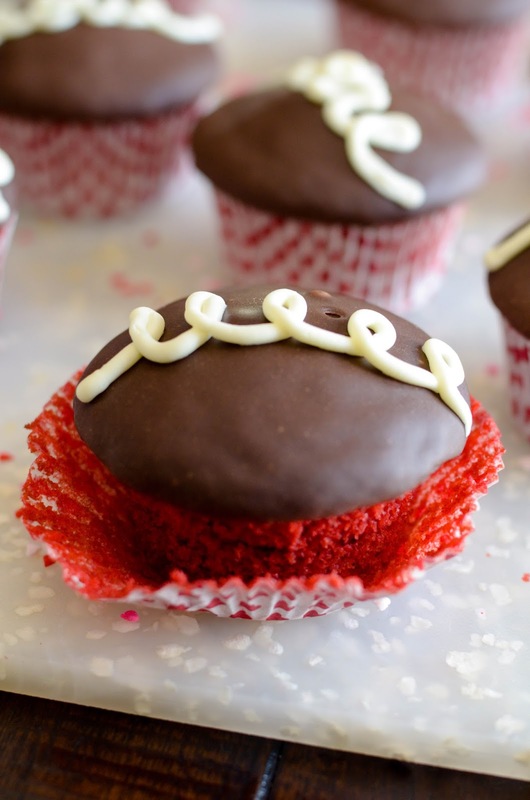 These cream filled red velvet cupcakes are topped with ganache and are oh-so-good! Bake cupcakes according to directions on box. Let cool completely. Fit a piping bag with the filling tip. Fill the bag with cream cheese frosting. Insert the tip into the center of the cupcake and fill with frosting. Repeat with each cupcake. Pat down any icing from the filling if necessary to smooth the tops of the cupcakes. Melt the chocolate frosting to a pourable consistency by microwaving it in a small bowl for approximately 30 seconds. Stir to make sure the consistency is even all the way through. Dip each cupcake top into the chocolate and let cool. Use the cream cheese frosting bag to pipe swirls on top of each cupcake. *If you would prefer to use a homemade recipe instead of a cake mix, that's fine too. I prefer a cake mix for the ease of using one. I think they are a great option for this recipe. **I've also used a smaller round tip (not specifically intended for filling) and it worked fine. Or you could scoop out the center with a melon baller or teaspoon, fill with frosting, and then replace the top. You might not get as smooth of a finish, but it will taste the same!